After David defeated Goliath, Saul's curiosity of David and his lineage grew. He sent Abner, the captain of Israel's army to investigate. This was not a routine request, as David was already in Saul's service. Scholars give an explanation that since, Saul planned on giving his daughter to David in marriage, it was appropriate to investigate David's background. Saul reward David handsomely by giving him a high rank in the army, which not only pleased the people but also the officers. Jealousy raged within Saul. How could the people credit David with more kills than him? 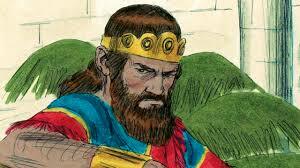 King Saul feared David was after his kingdom. On one hand, Saul orders David to take his place in Saul's kingdom, King Saul descends into a dark pit of jealously, anger and despair. He actually tried to kill David twice by throwing a spear at him. Saul understands that God has left him and blessed David. This strikes fear in King Saul's heart. Saul suspects David is after his kingdom which further sends him into a spiral of fear, paranoia and hatred. Saul rebels and attempts to destroy David. Without the Spirit of God within Saul, he's completely taken over by the influence of evil. Saul slips into a decline. Once God's anointed, he becomes filled with jealousy, hate, anger, malice and fear. Although, still wealthy and powerful, Saul is miserable, empty, and unhappy. Saul and David's relationship hangs in a delicate balance. Drawn to David, Saul knows he's blessed by God, and that strikes fear in Saul's heart. Fearing that David is after his throne, Saul rebels. He sets out to David. He tries many things, including personally throwing spears at David, Sending him into battles hoping he'd die, and providing his daughter as a bride to snare David. No longer seeking God, Saul seeks to destroy David, God's anointed, and defy God's will. Like a parasite, the fruit of God's Spirit is overtaken by evil by gradually allowing self-absorption and pride to overshadow the bereft Spirit in his life. David exemplifies a Spirit-filled life. As God's anointed, he has great military victories, is adored by the people, and supported by member's of Saul's household. David humbly submits to Saul's authority. Saul's choices provide us with a valuable lesson. we must closely guard our hearts. Spiritual growth takes effort. We must spend time alone with God, tuning our hearts to echo His, seeking to honor His will in our lives. Next in the King David Series: Saul's Attempts to Kill David.